Note: Thanks to some free tickets, I had the chance to watch the MSU/Gonzaga game in person. Here are some thoughts on the Spartans and their closer than expected early season test. Michigan State just knows how to close games. A text from a friend midway through the second half put it bluntly, “State doesn’t lose these games.” It seems so obvious, but it’s also so true. Nowadays it’s called swagger and Michigan State has it. 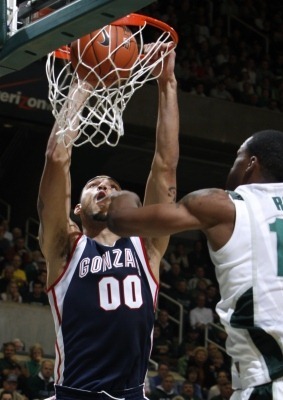 Gonzaga marched into the Breslin Center and punched Michigan State square in the mouth. They outplayed Michigan State at their own game for most of the 40 minutes. They pounded the ball inside and scored consistently while holding their own on the glass. They held onto the ball and led the game for around 35 minutes but, sadly, they boarded a plane back to Spokane empty handed. That was a Gonzaga team that is much better than most expected. Their young big men (including former Michigan target, freshman Kelly Olynyk) battled admirably against the always physical Michigan State frontline. It’s probably foolish to make a judgment based on one game but by my eyes, Gonzaga appeared to be a top 25 team that should make plenty of noise this March. But let’s go back to Michigan State. They played poorly; they didn’t shoot it well and they turned it over. But they hung in the game despite Gonzaga holding them off time and again. The Izzone waited patiently, ready to explode when Michigan State took the lead, and Durrell Summers and Kalin Lucas gave them the opportunity, coming alive down the stretch. If I need one basket to win a game, I’m giving the ball to Kalin Lucas. The great Izzo teams have always had that guy who just makes the biggest plays. 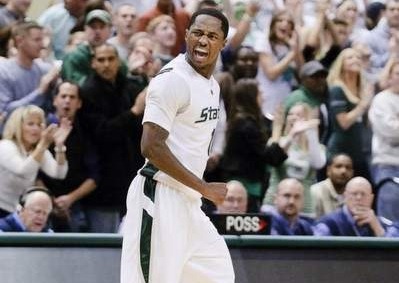 Before it was Mateen Cleaves or Drew Neitzel, now it’s Kalin Lucas. Kalin Lucas and Durrell Summers are the guys that will determine how far this team goes. There are plenty of question marks that came to mind watching them play. They need more secondary scorers, Lucas and Summers are great but they lack a true post scoring threat. Raymar Morgan has the ability to play like he did last night, but he is also injury prone and disappears for long stretches. 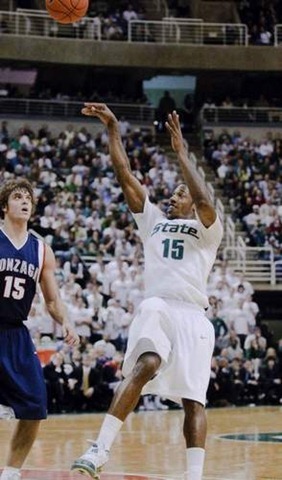 Kalin Lucas – The best player in the Big Ten. He’s a playmaker at heart and just knows how to make the big play. State fans should pray that he stays in school as long as possible. Durrell Summers – Summers is the guy who determines how good this Michigan State team can be. They are going to lean on him a lot. He’s the best athlete, best three point shooter, best slasher, and best defender on the team. They need him to score the ball and lock down the opposition’s best player. He did that versus Gonzaga, with 21 points (8-9 shooting), 11 rebounds while playing great defense on Gonzaga’s guards who shot a combined 8 of 29 from the field. Raymar Morgan – Raymar obviously has proven that he is talented enough to be a star in this league. The problem is that he has become not only injury prone but inconsistent. 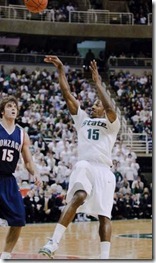 Michigan State needs him to be the consistent Raymar Morgan from his sophomore year. Derrick Nix – I was not a fan of his game in high school but he has continued to work hard on his body and you can see the results. Nix is the perfect MSU big man; he’s a big, strong brawler. Chris Allen – A guy with no confidence in his shot. He’s supposed to be Michigan State’s three point shooter but he hesitated and passed up several open three point looks and also got two three point shots blocked. He’s athletic on defense but he’s hurting Michigan State with his offense. Korie Lucious – Didn’t have a good game or play much. Can make the right pass and push the ball but I don’t think he’s much of a scoring threat from the field. 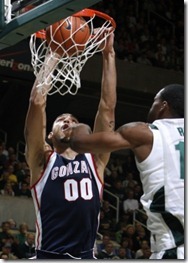 I also don’t think Izzo was comfortable playing Kalin and Korie with the size that Gonzaga has in the backcourt. Delvon Roe – I know he’s recovering from a concussion but man, 12 minutes, 0 points, 5 rebounds, 4 turnovers, and 5 fouls is brutal. I thought Delvon Roe was poised for a breakout season but early returns have been underwhelming. 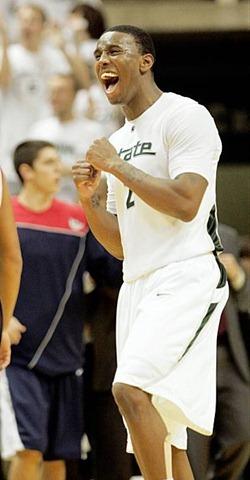 Draymond Green – He’s Michigan State’s Zack Novak. He’s a different type of player but he’s the glue guy that makes everything work. He hustles, rebounds, and has a tremendous basketball IQ. Garrick Sherman – Did he even play in the second half? Not sure why Izzo went away from him for good.